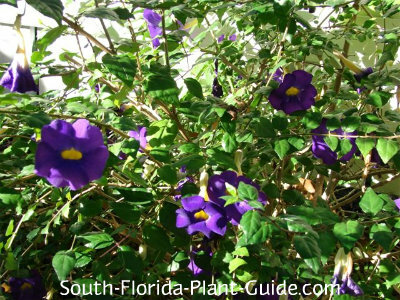 Thunbergia shrubs are exuberant purple flowering plants that can dress up any South Florida garden. This shrub is a vigorous grower with a sprawling form that often gives the plant an attractive, somewhat weepy appearance. The leaves are small and pretty for an overall fine-textured look. It blossoms with velvety flowers all year, more in warmer months. 'King's Mantle' has a rich, dark purple flower with a yellow throat. The color tends to be stronger in sun and look more blue in a bit more shade. These plants can be kept around 4 or 5 feet tall, though you can let them get much larger. Though lush and full during warm weather, this plant can look threadbare in winter so avoid making it a front yard focal point unless the area is a sheltered one. 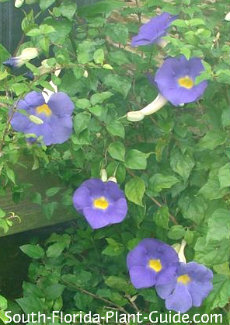 The lesser-known 'Blue Moon' variety has violet-blue blossoms and 'Alba' has white blooms. A relative is the exquisite Sky Vine. Best as an informal hedge or accent, this shrub works very well with a casual, cottage garden style. It can also be tucked into a tropical garden, or add some pizzazz to more typical landscaping. These are fast growers that do best in full to part sun. They'll also grow in partial shade though you won't get as many blooms. Thunbergias prefer the warmer weather of Zone 10. They're considered evergreen, though in a colder winter they can defoliate a little - or a lot. After a spring pruning they generally bounce back. 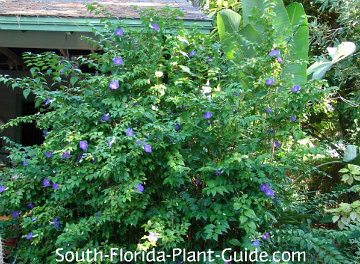 You can trim this shrub as small as 4 feet tall and wide...or allow it to grow bigger (12 feet or more) if you prefer. Add composted cow manure and organic peat moss (or top soil) to the hole when you plant. Trim lightly for shape as needed and do a hard pruning in spring (late March or early April) for size and/or to encourage new growth. This plant needs a regular drink of water, though it likes the area where it's planted to drain well. You may want to supplement feedings with bloom boosters like bone meal and liquid fertilizer. 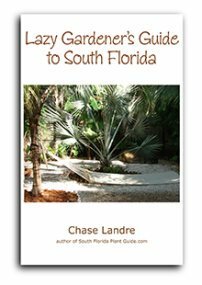 Place these shrubs 3 to 5 feet from the nearest plant. To grow in a row you can plant them 3 feet apart. Come out from the house 3 or 4 feet.Along a walk or drive, give them about 4 feet for clearance as they mature. This shrub will do fine in a container. 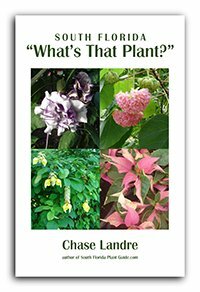 COMPANION PLANT SUGGESTIONS: Plum loropetalum, bush daisy, snowbush, African iris, silver buttonwood, hibiscus, and buddleia.